This is a delicious way of serving bacon and is a good alternative to traditional boiled bacon and cabbage. 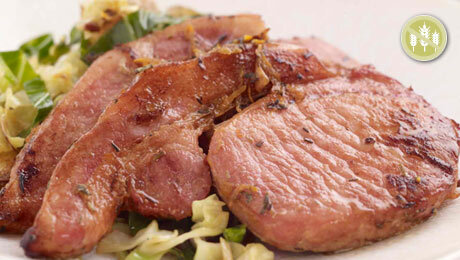 Cut the bacon into chops and place in a shallow bowl with 2 tablespoons of olive oil and the orange zest and juice. Add in the dried mixed herbs and stir well. Allow to marinate for 2-3 hours. Preheat the oven to 180°C/325°F/Gas Mark 4. Place the bacon chops and the marinade on a baking tray and cover with foil. Cut the baby potatoes into chunks. On a separate baking tray, arrange the potatoes with some chopped garlic and ½ tablespoon of olive oil. Place into the oven with the bacon chops and cook both for 35 minutes until they are cooked through. Remember to remove the foil from the bacon chops 10 minutes before the end of cooking. Heat a large frying pan or wok with a little oil, add in the sliced onion and cabbage, and cook gently for 3-4 minutes. Next add in the soy sauce and the water, and allow the cabbage to continue to cook for another minute or two. Arrange the cabbage in the middle of the plate with the bacon chops sitting on top and a side portion of the baby roasted potatoes.